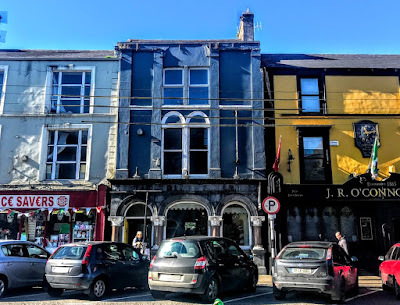 In my tour of the architectural heritage and legacy found in the shopfronts and houses of Charleville, Co Cork, I skipped over Brúdair’s Coffee Shop and its traditional shopfront on the Main Street. This is not because I ignored or missed this shopfront, but because it such a significant landmark in the town and also the birthplace of Daniel A Binchy, the first Irish Minister or ambassador to Germany from 1929 to 1932. This is a terraced single-bay, three-storey house, and on the ground floor there is a limestone and marble shopfront with the carved name Binchy and the date 1849. The arcaded three-bay shopfront has engaged polished red stone columns with moulded bases and ornate composite capitals, over square-plan carved limestone plinths and a supporting central elliptical arch and flanking round arches, all with moulded archivolts. Above, there is a limestone facing and fascia with a moulded limestone cornice above and string course below. The raised limestone lettering ends with foliate motifs. This carved stone shopfront is a fine example of the quality of 19th century stone carving, with an interesting and colourful combination of red columns and grey stone. The timber six-panelled door is original. The contrasting style of the upper floors adds to the character of the building, which is a local landmark and forms a significant part of the streetscape of Charleville. Daniel Anthony Binchy (1899-1989), an academic, diplomat, polyglot and lawyer, has been described as ‘a man ahead of his time’ and ‘a public intellectual,’ and he was a life-long friend of the writers Seán O’Faolain and Frank O’Connor. The Binchys were an affluent, shop-keeping family with a tradition in medicine and the law. They are thought to have originally come to Ireland with Cromwell but became Roman Catholics in the dying days of the penal laws. The Binchys were committed Anglophiles, and conservative and Catholic in the Redmondite tradition. Daniel Bincy was born in the Binchy house on the Main Street in Charleville in 1899, a son of William Patrick Binchy, shopkeeper, and his wife Annie (nee Browne). William Binchy took the pro-Treaty side in the Irish Civil War in the early 1920s, and dismissed and refused to rehire workers who had taken the anti-Treaty side. One of those dismissed John Higgins. For the rest of his life, John Higgins lived in hardship, and he was the father of President Michael D Higgins (and here). Daniel Binchy went to school in Charleville and Banagher, and then to the Jesuit-run Clongowes Wood, where one of his teachers was Joseph Walshe, later the first head of the new Department of External Affairs – as the Department of Foreign Affairs was then known – and a major influence on Binchy’s later career. At University College Dublin, Binchy was the Auditor of the Literary and Historical Society in 1919-1920. He collected a number of first-class honours at UCD, graduated with a BA in legal and political science and completed an MA in history. He won a National University of Ireland travelling studentship, and studied at the University of Munich in 1921, where he became fluent in German. During his student days in Munich, Binchy became a first-hand observer of Hitler and on a murky November evening in 1921,’ when he was invited by a Bavarian fellow student to a meeting of ‘a new freak party’ in a beer cellar.’ It was his first – but not his last – encounter with Hitler, and he was not impressed. Binchy returned to Dublin and his studies of mediaeval history, and his doctoral thesis was a study of the Irish Benedictine monastery of Ratisbon. He was appointed Professor of Roman Law and Jurisprudence at UCD in 1925, and soon became one of the great Celtic Studies scholars of his day. Later, he would hold senior positions in UCD, Corpus Christi College Oxford, Harvard and the Dublin Institute for Advanced Studies. But his academic career was diverted in 1929 when he was appointed by WT Cosgrave’s government as the first Irish minister to Germany, and until 1932 he was the equivalent of Ireland’s ambassador to Germany. Binchy never really wanted to be an ambassador, but his reports from Berlin show his acute grasp of the unfolding events and personalities in the critical last days of the Weimar republic, combined with an ability to make important contacts, including a good relationship with President Paul von Hindenberg. However, Binchy had little time for the round of social engagements, the dinners and the formalities of diplomatic life. Binchy promoted a modernising and independent Irish Free State while experiencing at first hand the disconcerting rise of Nazism and fascism. He had a second encounter with Hitler in Berlin in 1930, when the Nazis were on the brink of power. Hitler delivered a near-replica version of the speech Binchy had heard in Munich almost a decade earlier, and realised Hitler simply recycled his speeches throughout his career. While his delivery had improved – Hitler practised his gestures in front of a mirror – and his words were tailored to his audience, he always said much the same thing. His reports to Dublin were sharp and prescient. He predicted the consequences of the failure of the democratic parties to work together and had no illusions about the brutality, cynicism, anti-Semitism and murderous racism of the new regime. Binchy reported all of this to Dublin with great clarity. He returned to Dublin and academic life in 1932 and was followed in Berlin by Leo T McCauley (1932-1933), who failed to grasp the dangers Hitler posed and who actually suggested the Jews brought on themselves their persecution in Germany. McCauley was followed from 1933 to 1939 by the anti-Semite and Nazi admirer Charles Bewley (1888-1969), who persistently thwarted efforts to obtain visas for Jews wanting to flee Nazi Germany in the 1930s and to move to the safety of the Irish Free State. Back in Dublin, in March 1933, just weeks before Hitler accessed absolute power in Germany, Binchy published an analysis of Hitler and the Nazis in a 20-page paper in Studies, the Jesuit journal published in Dublin, drawing on his student days in Munich and his experiences as the Irish diplomat in Berlin. He described Hitler as ‘a born natural orator,’ and described his style of speech: ‘He began slowly, almost hesitatingly, stumbling over the construction of his sentences, correcting his dialect pronunciation. Then all at once he seemed to take fire. His voice rose victorious over falterings, his eyes blazed with conviction, his whole body became an instrument of rude eloquence. As his exaltation increased, his voice rose almost to a scream, his gesticulation became a pantomime, and I noticed traces of foam at the corners of his mouth. In 1937, Binchy spent time in Italy, despised Mussolini, and wrote a scholarly analysis of Italian fascism. After World War, in 1946, Binchy was awarded a senior fellowship at Corpus Christi College, Oxford, where he and Myles Dillon, a brother of the Fine Gael politician James Dillon, became the two resident Irish Celtic scholars. Binchy returned to Ireland in 1950 to take up a fellowship at the Dublin Institute of Advanced Studies, but he continued to spend much time abroad, and was a visiting professor in Harvard in 1954. His article on the old name of Charleville, first published in 1963, discussed the relative merits of the names of Rathgoggin, Charleville, Rath Luirc and An Ráth for the town of his birth. Binchy is famously the subject of a comic verse by Flann O’Brien. His academic pursuits at the Dublin Institute for Advanced Studies are satirised affectionately in Brian O’Nolan’s poem Binchy and Bergin and Best, originally printed in the ‘Cruiskeen Lawn’ column in The Irish Times and later included in The Best of Myles. Binchy’s life story is the subject of Professor Tom Garvin’s definitive biographical study, The Lives of Daniel Binchy: Irish Scholar, Diplomat, Public Intellectual (Dublin: Irish Academic Press, 2016). 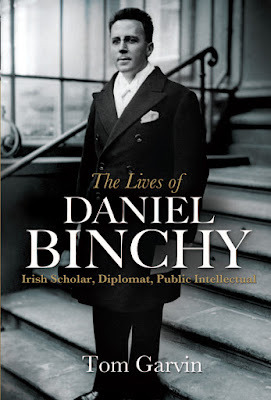 Today, Daniel Binchy’s main claim to fame may be that he was a rather remote and awesome uncle of the author and The Irish Times writer Maeve Binchy (1939-2012), William Binchy, Regius Professor of Laws at Trinity College (1992-2012), and other remarkable members of the Binchy family. Binchy was a perceptive assessor of European Fascism. He judged at a very early stage that Hitler’s regime would prove far more evil and murderous than its allies. In the case of Italy, he recognised Mussolini for the buffoonish thug that he was, but also suspected that the Italian regime would ultimately prove far less steely than its German ally. His meeting with Adolf Hitler and his insightful paper in Studies were a brave warning against the dangers of totalitarianism. Perhaps today we need someone with his perceptive insights to warn us of the dangers of born natural orators, who rehearse their gestures and gesticulations before speaking, who seek to blame all their nation’s woes on identifiable but marginalised groups, and who promise to make their nation great again. Binchy and Bergin and Best.